1. The long up, up, uphill from Le Chable to Cabane Mont Fort passing through a couple of small and rural hamlets before arriving at a rather sad landscape disfigured by ski runs about an hour before reaching the Cabane (details of the Cabane can be found in the blog archives). 2. The next morning finding the cabane like a boat on a sea of white clouds that hid all the valleys below....whilst the peaks of the Grand Combin and the Mount Blanc Massif rose clear and glittering in the morning light. 3. The path to Cabane de Louvie where we came across some chamois, and the turqoise blue Lac de Louvie. 4. Finally, the long and at times steep descent to Fionnay - not my favourite way of ending hikes! Other hiking ideas in the Val de Bagnes can be found at: http://www.verbier.ch/En/Summer/Hiking/ (hike details unfortunately in French). 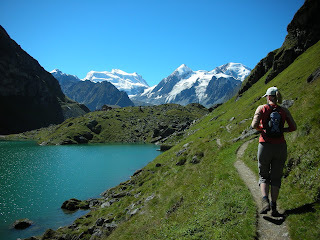 This blog gives a description (in French) of what sounds like a strenous 3 day hike around the Cols above Verbier and Nendaz starting and ending from Le Chageur http://www.hikr.org/tour/post9499.html.